Update: It’s live. Chrome 64 is now rolling out on the Google Play Store. Chrome has become the most popular web browser in the world, and this paired with their search ranking algorithm has enabled Google to shape the way a lot of websites function. Pop-ups and loud audio from auto-playing videos used to be major annoyances on the web, for instance, but Chrome has blocked much of this from happening so that our browsing experience can be more enjoyable. Expanding upon these protections, Google has just announced three new changes that will be implemented in the next few releases of Chrome. One of these major annoyances happens when someone visits a website and then an unexpected redirect takes place without the user consenting to anything, and in some instances before the user can even react to it. Not only can this be annoying, but it can also be malicious as it could initiate a download for a piece of malware. This typically happens with 3rd-party iframes, and it will be blocked in Chrome 64: users will be shown an infobar instead of the redirect going through (unless that person was interacting with that frame). There are times when unwarranted issues can happen while the person is interacting with the website as well. For example, some websites have gotten around pop-up blocking protection by having a link open up in a new tab, and then making the main window navigate to an unwanted website. Chrome 65 will begin detecting this behavior and again will trigger an infobar to prevent the main tab from being redirected. The last bit of extended protections coming to Chrome that Google covered today deals with links to third-party websites disguised as play buttons, other site controls, or transparent overlays on websites that capture all clicks and open new tabs or windows. 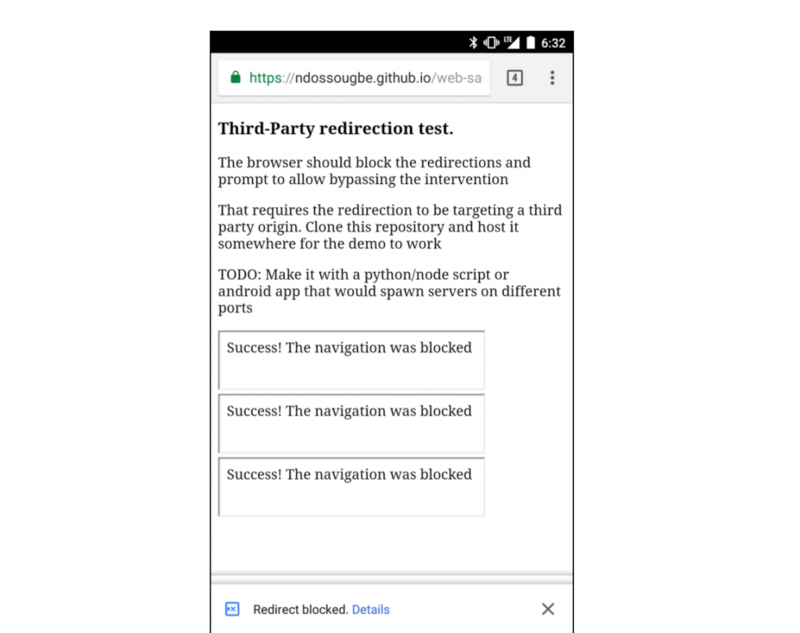 These have proven to be difficult to detect automatically, but in January Chrome’s pop-up blocker will prevent sites with these types of abusive experiences from opening new windows or tabs.